Had a lovely day of lounging in the park while my friends Jim and Malachy played wiffle ball. We declared the afternoon was not unlike a Manet painting. 'Cept for we weren't wearing our Sunday whites and I forgot my parosol. And instead of tea we had beer. And instead of a steam train (is that the right time period??) there was...the el. Anyways, by god there was poetry. 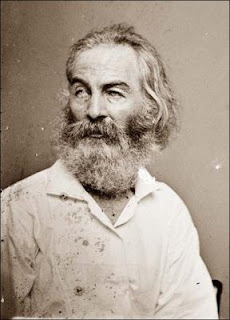 I read aloud inspirational excerpts from Walt Whitman's "Song of Myself" from Leaves of Grass. The cajones on this guy! I'd like to share some passages that are particularly yawp-inducing (re: Dead Poet's Society). Seriously though, I urge you to imbibe the Walt Whit, reader! Drink up the lines and let them dribble down your chin--this song is for you! Celebrate yourself! Life is fleeting--open up and sound your barbaric yawp to the world!!! Maternal as well as paternal, a child as well as a man. Stuff'd with the stuff that is coarse and stuff'd with the stuff that is fine"
I find no sweeter fat than sticks to my bones." And the good or bad I saw of myself I say of them." I can cheerfully take it now, or with equal cheerfulness I can wait." Below is Philly Brewing Company's lovely ode to the old bard. Give me a slice of lemon and send me to summer, please!